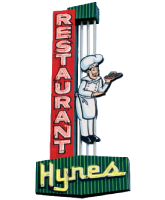 Welcome to iconic Hynes Restaurant, serving home-cooked meals to the Greater Moncton area. We were established in 1939 by James and Elizabeth Hynes and are now owned by the third generation of Hynes - Jamie and his wife, Josette. We look forward to serving you. Hynes Restaurant specializes in comfort food and offers several you-bake frozen dinner options that you can reheat yourself for quick meals at home. We also serve breakfast all day and offer a children’s menu. Our full menu is in both English and French. Our decadent desserts, including chocolate cake with boiled icing or strawberry shortcake, along with breakfasts, children’s menus and more, are now available for easy viewing. Take a look at our children’s menu, house specials, favorites, breakfast menu or desserts. As always, you can view our full menu. So come visit us today and find out why our customers always come back to Hynes Restaurant.